Great Stuff for Me and Maybe You. The complete list of gear and clothing for my life in 2018. I have an updated this year’s gear. Minimalism led me to simplify my stuff, keeping just the items that are regularly used and give me joy. I considered taking the 100 Items Challenge, but decided I would be too focused on curating stuff rather living a meaningful life. I am following an organic process… holding on to things that are adding value to my life and remove those that are a distraction. Here is a list of all my possessions excluding our family’s furniture and kitchen. Items in bold are exceptionally great… I regularly finding myself telling people about them. I am happily use items marked with “*”, but they won’t be replaced if lost. Making this list was originally inspired by one bag lifestyle and Tynan’s Gear posts. I hope this list might encourage others to surround themselves with items that truly bring them joy and remove items that are a burden… and not to encourage people to just consume more. My traveling list is a subset of the items in this post. Flexon eyeglass frames with high index progressive lens. Seeing clearly is such a blessing. I break most frames within a year of getting them. Flexon last me several years. My current pair was purchased in 2010, though the lens have been replaced a few times when my prescription was updated. Garmin 935 Watch: is a do everything watch which is light enough that I don’t mind wearing it everyday. It has decent integration with my phone and provides every fitness and activity tracking feature I want. I appreciate the alert on the watch when it loses bluetooth connection with it’s paired phone that reduces the likelihood of leaving the phone behind. There are a number of other sport watches I would recommend if you wanted to spend less money. Flowfold Minimalist Wallet which holds my IDs, credit cards, and a few bills taking up minimal space. The Nomatic Wallet is another good minimalist wallet. Uni-ball Vision Micro-Point Rollerball Pen and Post-It Notes for jotted down ideas until I can get them into an electronic system. Victorinox Rambler Pocket Knife is the smallest, most usable tool I have found with a phillips head & flat screwdriver, scissors, knife, bottle opener, and nail file. Even though the blade is tiny, TSA will confiscate this knife. When flying I switch to a Swiss+Tech Utili-Key which is not as usable as the Rambler, but for years has made it through TSA checkpoints without being confiscated. I have notes on other knife options. Apple iPhone 6 on Verizon. At some point I will switch to a new iPhone for a significantly improved camera. Apple’s iOS usability used to be superior to Android, but Android has mostly caught up except for management of audio I noted with the Pixel 2 below. I continue to use an iPhone because the rest of my family is in the Apple eco-system (iMessage, Photo sharing, iTunes, etc) and I like it’s more security oriented stance. I continue to use Verizon because I find their coverage best in the places I spend my time. Verizon is “overpriced”, but I value working coverage over saving money. Apple AirPods have decent sound quality while letting in ambiance noise providing situational awareness, stays in place during the most vigorous exercise, no wires to get tangled, has good user interface with Apple products (would be perfect if I could change volume) and ok with others, acceptable sound quality, the ear buds run 5 hour, fully recharges in 20 minutes, with a carry case which can recharge them 4-5 times. With Apple products they just work! They aren’t rated for water resistance, but after more than a year of using them while sweating heavily, rides and runs in the rain they continue to function flawlessly. Zojirushi Double Walled Mug (1 + 1*) can easily be used one handed, locks so it doesn’t open accidentally, pours at the perfect speed, the mouth is wide enough for ice cubes, and best of all does a better job insulating than any other double walled mug I have used. Liquids stay fairly warm or cold for up to 24 hours. I have a silver colored mug. I often misplaced it at work. When it was misplaced for more than a week, I purchased a replacement thinking it was lost for good. Realizing findability was important, I purchased a Deep Cherry color mug which is much easier to spot across the room. After several weeks I found my original Silver mug. Now I have the Red mug which lives at work, and the silver which I use when not at work. Zojirushi makes a number of other excellent styles of mug and Snowpeak makes a beautiful Titanium double walled mug. 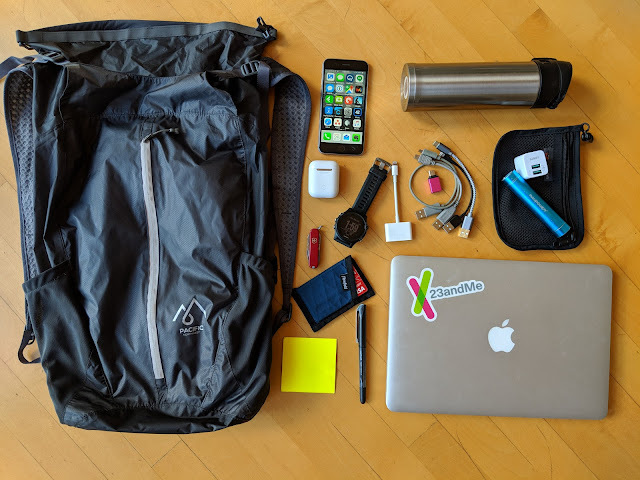 Tech “Survival Kit” which is stored in a small mesh pouch. RAVpower Portable Charger/Flashlight is small enough to fit in my pocket while proving power to recharge my phone. Aukey Ultra Compact USB Charger is one of the smallest chargers with two slots and up to 2.4A amps. 6” USB Lightning, USB micro, USB mini, and USB-C cables with some adaptor tips which let me connect pretty much any two USB devices. A Lightning to HDMI converter. A USB thumb drive because sometimes I need to transfer / store files. Macbook 13″ Pro Laptop. I have tried using tablets but still find myself prefering a real laptop. I would love to find a lighter and more compact laptop, but I like 13” screens, and am still pretty much committed to OSX because it has the applications I use and the good integration with iOS devices. Matador Freerain24 is a nicely designed daypack which: carries well even when running, weights only 5.5oz, easily folds into it’s own pocket, and keeps contents dry even in the worst rain. I actually own a PNW Sea to Sky Waterproof Backpack which is a ripoff of the Freerain24. Roon software isn’t really an item, but it effected many of my decisions related to audio playback. Roon integrates my iTunes library which is made up of CDs ripped using ALAC codex with the TIDAL streaming service to provide loseless audio to multiple speakers around the house. Roon would be perfect if the remote clients supported off-line caching of music so playlists and favorite music was accessible when out of the house, and was a bit less buggy (it sometimes stops playing which requires me to restart the app on my Macintosh). I carry music on my phone by exporting play lists from Roon to TIDAL, and then use the Tidal client on my iPhone to do offline playback. If I didn’t care so much about sound quality I would be using Spotify which would make everything simpler. KEF LS50 wireless monitor speakers with a built in DAC and amplifier designed for the speakers. Good quality sound that fills a room, excellent for near field use in a nicely designed, compact package. Can take TOSlink, USB, Bluetooth, analog, and several IP based streaming protocols inputs over ethernet or WiFi. Roon can stream directly to it over the network, but it’s not Roon-Ready so can’t be synchronized with other Roon-Ready systems. The iOS remote application is poor. I drive the LS50 via USB on a computer running Roon which remove the need for the KEF remote and the speakers can be synchronized with other Roon Ready end-points giving me whole house music. I still prefer the sound quality of electrostatic speakers with audiophile grade full electronics, but I am happy that I downsized my stereo so I could focus on other things. Anker 60W PowerPort+ 5 with 1 USB-C and 4 traditional USB ports has enough ports to charge every device I use on a daily basis including my 13” MacBook Pro. When MacBook isn’t being charged can rapidly charge all my devices. La Crosse Battery Charger which does a great job charging any combination of 1-4 AA or AAA batteries for Eneloop Pro Batteries are the best rechargeable batteries I have found. Near maximum capacity for the form factor while retaining most of their charge for months. Olight I3S EOS Flashlight is slightly larger than the single AAA battery which powers it. Selectable output of 8,50,80 lumens permits the user to make a trade-off of runtime vs brightness. The combination of the flash on my Phone and the RAVpower Portable Charger/Flashlight should have rendered this flashlight unnecessary, but when I take walks around the neighborhood at night I find myself reaching for this tiny light. I have notes about other flashlight and headlamps. Google WiFi Mesh network access points easily install and just work when you have an area than a single WiFi router isn’t sufficient. There may be faster / more featureful options out there, but the Google devices work flawlessly and are visually appealing. Kindle PaperWhite* lets me carry the majority of my library with me and every book can be displayed with large print for my aging eyes. Love being able to quickly search for notes / hi-lighted passages. I miss physical books and knowledge retention with paper books is still better than when using an e-reader, but the connivence of the Kindle outweighs this for me. I often use the Kindle reader on my phone, but the larger display surface of the Paperwhite, much longer battery life, and usability in sunlight means the PaperWhite goes on most trips I take. LG OLED55B6P SmartTV* purchased for the family movie night and other group activities that use a screen. I would be content using the screen on my laptop or even iPhone for the occational video streaming I watch. That said, the picture quality is amazing and the webOS based controls work well. Westone 5ES custom In-ear-monitors (IEM) with excellent sound quality and comfortable enough to wear on 14 hour flights. They reduce noise by 35db which makes travel much less fatiguing for me while being much smaller and having better sound quality than active noise canceling headphones. Stored in a medium size HumanGear GoTubb with adapters. Sennheiser HD800 Headphones* for when I want very high quality sound and don’t want to bother others too much (sound does leak). These are the second best sounding pair of headphones I have ever used, at 1/3 the cost of the best (Stax SR-009). I have a headphones post with additional information. Chord Mojo DAC* offers a nice design, good quality sound, good price / performance ratio, portability, has enough power to happily drive Sennheiser HD 800, and has an internal battery which enables it be driven via USB from phones and portable DAPs. I have written about other DACs. Tom Bihn Synapse-25 Backpack is my travel luggage. Wonderfully designed with just the right amount of organizational features. Large enough for nearly every trip I have taken, while small enough that it fits under every seat I have used and has never been viewed as “luggage” by transportation operators. The laptop cache works brillantly. Have notes about other travel packs. Patagonia Ultralight Courier Bag* is perfect size for day use and compact enough that I can pack it away in my backpack when moving between towns. Easy access without taking it off, in hot weather maximized ventilation, and can be used at the same time that I am carrying a backpack. Water Bottle Sling Nancy brought back from South America. Great for days I just need water and nothing else. Sometimes borrow my wife’s Chico Water Bottle Sling because it can hold my water bottle + my umbrella or windbreaker. Montbell Trekking Umbrella has the best balance I have found between small/light and canopy size. It has survived fairly strong wind/rain storms. In warm to hot weather much more comfortable than wearing a rain jacket. PackTowel Ultralight (Bodysize/XL) dries amazingly quickly, is compact, and is very effective. The XL is large enough that I can wrap it around my waist like a small sarong. For awhile I used a medium/face size which packs in a tiny space. I found the face size sufficient for me to dry myself after a swim or shower, but I am willing to carry a larger towel for the added versatility and ease of use. TYR Corrective Optical Performance Goggles so that I can actually see when I am swimming. I keep the goggles with a generic swimming cap because some pools require them, and small combination lock. Stryd Footpad captures workout intensive better than using pace or heart rate. The Garmin Running Dynamics Pod might be a cheaper way to get the same sort of data. The RunScribe Plus now syncs to Garmin and other eco-systems and might provide more actionable insights about running form that other running power meters. Wahoo Tickr X Heart Rate Strap because optical heart rate monitors aren’t sufficiently accurate for HRV measurements and aren’t responsive enough to track interval training. I mostly use it as a basic HRM, but if you use the Wahoo fitness app there are a number of other metrics that it can record. There are plenty of good HRM including Garmin’s Tri HRM which can be worn swimming and the Viiiva HRM which can be used to bridge other sensors between BlueTooth and ANT+. These days I mostly use Power rather than heart rate to track intensity, and the optical HRM on my Garmin 935 is almost good enough to replace the strap. 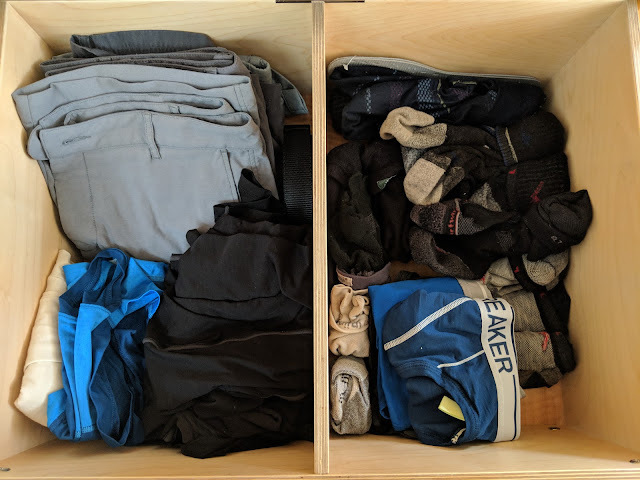 I have notes about selecting clothing for an active life which goes in detail about how to select clothing for a wide range of activities and conditions. PolarBuff is a versatile item which can be used as a neck cozy, balaclava, beanie, hair band, and in a number of other configurations. I typically use it as a beanie. Tilley LTM6 Hat provides good sun protection while offering decent ventilation. I think it’s one of the more stylish hats which provides good sun protection. My wife says I am wrong… that my SunRunner is better looking, but is willing to put up with me wearing this hat when the sun is big. I have a list of other hats that you might prefer. REI eVENT Rain Hat (not shown): a discontinued ball cap made from waterproof/breathable eVENT. Used when hiking or running when I know it’s going to be raining. OR SunRunner Cap* (not shown) ball cap with a removal veil that is very packable. Downside is that it looks a bit silly when used with the veil and air flow when using the veil is less than when I wear the Tilley. 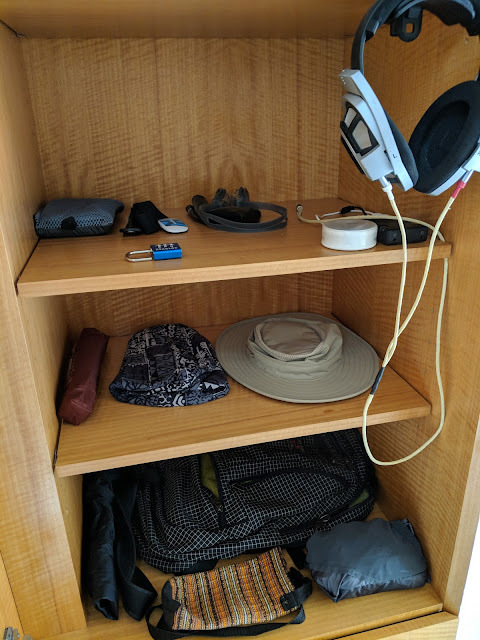 I use this hat when I want some shade for my eye but don’t need a full brim, when I need a hat that’s more compact than a Tilley, or when I forgot to grab the Tiley hat (the SunRunner lives in the trunk of my wife’s car). Mountain Hardware Grub Gloves (not shown) medium weight PowerStretch gloves with a quilted mitten cover which folds away into the back of the glove making it comfortable to wear in a wide variety of conditions. Outlier Slim Dungarees (5) softshell pants in the style of jeans. Wonderful fit, looks good, excellent mobility. Thanks to the NanoSphere treatment very stain and water resistant. They are perfect except when it’s >80F and I am active. They seem pricy, but the per day cost of wearing is about the same as denim jeans. Maker & Rider makes a nice alternative. BPL Thorofare Trekking Pants (not shown and no longer made which is a shame) are ultralight, ultra-compact pants which are surprisingly weather resistant, quick drying, and feel comfortable against the skin. They aren’t used in day-to-day life. I used them for cool weather backpacking and on trips where the weather is perfect for shorts (e.g. too hot for the Outliers) and I will need to wear long pants to be culturally appropriate. When the Thorofare pants wear out I will replace them something like Royal Robin Global Traveler, Patagonia Quandary, or ArcTeryx Rampart pants. White Dress Shirt purchased to be worn with suit or blazer when more formal clothing is required. Peach Button Down Shirt* for when my wife wants me to wear something at is a bit different than normal (for me). Black Checked Button Down Shirt* for when my wife wants me to wear something nicer than a tee-shirt but less than a suit, white shirt, and tie. Wool and Prince Blue Oxford Shirt* (not shown) is a blue dress shirt my wife loves. Crisp look and a slim fit while still having all the advantages of 100% wool. 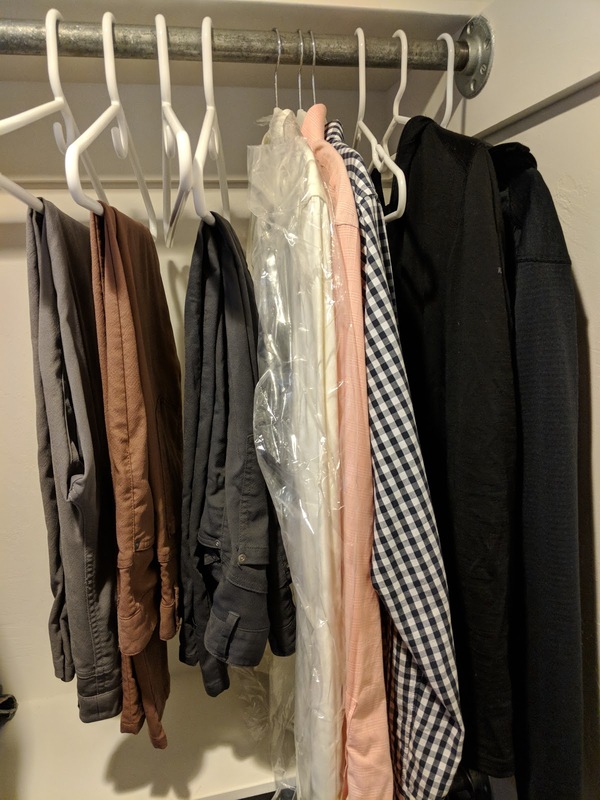 Outlier Air Forged Oxford Shirt* Fits me well, made from durable nylon weave so it dries quickly and doesn’t wrinkle when traveling while looking nicer than many “travel” shirts. Icebreaker Wool Hoodie: (4) Oasis 200wt merio wool hoodie with 1/4 length zipper. Worn when it gets too cool to wear just a tee-shirt. Icebreaker seems to have discontinued this model. Patagonia Capilene Thermal Weight Hoody for cool/cold weather outdoor activities. Without wind protection the grid weave lets air flow through letting heat vent out. With a shell it insulates well. Comfort down to 30F when running without a shell, below that with a shell. When walking keeps me comfortable down to 40F when combined with a wind shirt. I am reasonably comfortable engage in high energy activities when it’s 65F by fully opening the zipper and pushing the sleeves up to my elbows. Dries amazingly quickly and feels more comfortable than any other shirt I have used when it’s wet. Montbell Tachyon Windshirt a 1.8 ounce wind shirt that can be compressed into something slightly larger than a cliff bar. Windshirts, especially when combined with a air permeable middle layer provide comfort over a huge range of conditions. I could use my Norvan SL as a wind jacket, but given the durability/expense of the Norvan it makes sense to use a cheaper jacket when I don’t need rain protection plus the Tachyon is lighter, more breathable and packs more compactly. ArcTeryx Norvan SL Rain Jacket is one of the lightest, most breathable rain jacket currently available. I can actually wear it comfortably jogging in cool, rainy weather. 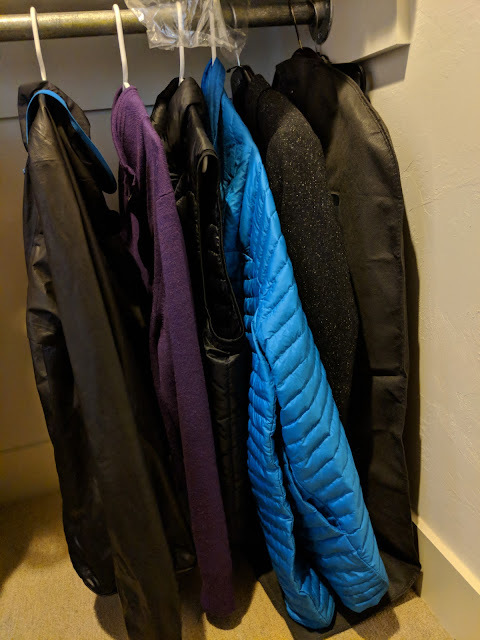 Other options are discussed in my post about rain gear. Zpacks Vertice Rain Pants are simple, light, breathable, waterproof rain pants. Used when commuting by bike, hiking, or backpacking in the rain. North Face TKA80 (not shown): Fleece which is lighter weight and less bulky than most. I love the convenience of a full zipper. Unfortunately this has been discontinued. Montbell’s Chameece Inner Jacket would be a good alternative. My wool sweater can be worn in a wider number of situations, but isn’t as convenient or durable. Mid-Weight Merino Wool Sweater is a bit less convenient to take off/put on compared to a full zipper fleece, but provides similar insulation and is much more appropriate to wear to a business event or when going to a nice restaurant. Uniqlo Ultralight Down Vest is decent quality, low price, with just the right amount of insulation for me. Combined with my sweater and a shell keeps me warm enough in the coldest weather I normally encounter. Patagonia Down Shirt with 23andMe logo. Even though it’s bit more insulating that I need around town, I want to show my company spirit and my wife thinks it looks better than the combination of the above items. The Patagonia Micro Puff Hoody using PlumaFill insulation would be better for back country use thanks to it’s superior water resistance. The Montbell inner down jacket continues to be the price performance champ, and Uniqlo’s down jacket is a good alternative for someone on a tight budget. Boss Blazer Jacket. Used when going out and it’s appropriate to be wearing something more dressy than a hoodie, but a full suit is too formal. I often wear the blazer over my tee-shirt rather than taking a more traditional “outdoor” jacket. Outlier New Way Shorts (4) are nice looking shorts which fit me perfectly, don’t have cargo pockets, are durable and dry reasonably quickly. I am sure there are less expensive shorts that I would like, but I don’t need more shorts so haven’t bother to look. Zootsports Performance Tri Shorts works well cycling, running and swimming. They are comfortable for all the activities I engage in, in a wide range of conditions. They have reduces issues with chaffing, dry fairly quickly, and are reasonably comfortable when wet. They have side pockets large enough to hold some nutrition and my phone so I don’t need to use a special cycling jersey. I never need to think about what shorts to wear when I am going to engage in vigorous physical activities…. I just grab my pair of zoot. Icebreaker Anatomica Tee-shirt (5) merino wool with just a bit of lycra for a body hugging fit. This tee-shirt fits me perfectly, looks good, is super comfortable, doesn’t smell after several days of wear on the road, and dries fairly quickly. There are two downside. First, they are pricy especially in view that they wear out more quickly that a cheap cotton tee. Second, they don’t work as well as synthetics when engaged in high energy activities where you are sweating a lot. There are a number of other good merino wool shirts from Smartwool, Outlier, and Wool&Price. Icebreaker Long Sleeve Oasis Crew (not shown) orange & grey color which was a Christmas gift from my wife to add some color to my wardrobe. Columbia Omni-Freeze Zero Shirt: Picture shows a blue shirt which has been discontinued, but there are other models which use Omni-Freeze fabric that helps cool when working out in moderate to hot conditions. Pretty much any “runner” weight shirt would work well. Icebreaker Anatomica Briefs (7) the most comfortable underwear I have worn. Downsides are that they start getting holes after a year and they are expensive. Some people prefer boxer style but I see no reason to have extra fabric on my thighs. Good alternatives are the synthetic travel oriented briefs from Ex Offico and the comfortable but expensive underwear from Saxx. Darn Tough Socks (8) are unsurprisingly durable since they come with a lifetime warranty. I found they fit and perform very well and come in a wide variety of thicknesses, lengths, and colors. I like the endurance light socks. Icebreaker and the Smartwool PhD line are good alternatives. Injinji Ultralight Toe Socks (2) for long distance runs / hikes. Generally I prefer wool, but I found light weight wool toe socks get holes very quickly. Rocky Gore-Tex Socks are the best way I have found to keep my feet reasonably clean, dry and warm in messy back country conditions. Often worn with Keen sandals to maximum breathability and speed drying once they are out of the water. Keen Clearwater CNX are the lightest sandals Keen makes. I liked the minimalist sandals made by luna and Xero Shoes but the toe protection of the Keens makes them a clear winner for me. If worn with gray socks they can pass for shoes. Comfortable in a wide range of conditions. I can run in them when I don’t have my Alta running shoes with me. Alta Running Shoes are the best running shoes (trail and road) that I have used. Wearing these shoes with toe-socks has allow me to do marathon length runs and 20+ mile days backpacking with no blisters or foot pain. Just one week after purchasing my first pair of One V2.5 I completed the Big Sur Marathon without issue. I like the models with minimal cushion. I currently use One V3 for road running and the Superior V3 for trails. Vivobarefoot Gobi II are extremely light weight, zero-drop, minimalist ankle boots which can be worn with casual clothing and my wife tells me they are acceptable to wear with a suit. Love them because they are light weight and comfortable. Two downside are that they take longer to put on and take off than low rise shoes and my feet can feel tired if I have been walking 14+ miles each day, for several days. Carots Shoes* are formal looking zero drop shoes. These are the only minimalist shoes I have found that looks like traditional dress shoes (heels and and tapered toe) that are sufficiently comfortable for day long wear. These were purchased before I discovered that the Gobi II were acceptable footwear with my suit. Skinners* (Not Shown) Socks with durable flexible coating on bottom so they can be used like shoes. Small and compact. Use as slippers, when I biking somewhere and then want to walk around without cleats, or when I am in the mood for barefoot running. Topo Running Shoes* (Not Shown) are zero drop minimalist running shoes. My model is a bit lighter than their current zero drop road running shoe. These shoes live at work for the days I ride my bike and don’t want to clomp around with cleats all day. Withering Body WiFi Scale (Not shown) makes it easy to track weight which is well integrated to Garmin, Fitbit, MyFitnessPal, LoseIt, and numerous other health tracking eco-systems. Oral-B/Braun 4000 Electric toothbrush (Not shown). Oral-B and Sonicare both make excellent toothbrushes which are significantly more effective than using a manual toothbrush. REI Micro Shower Bag is the perfect size for my toiletry kit while providing just enough organizational features to make it easy for me to find everything quickly. Holds a number of the items listed above in the “bathroom” section. Gillette Mach-3 Razor + Pacific Natural Shaving Oil. 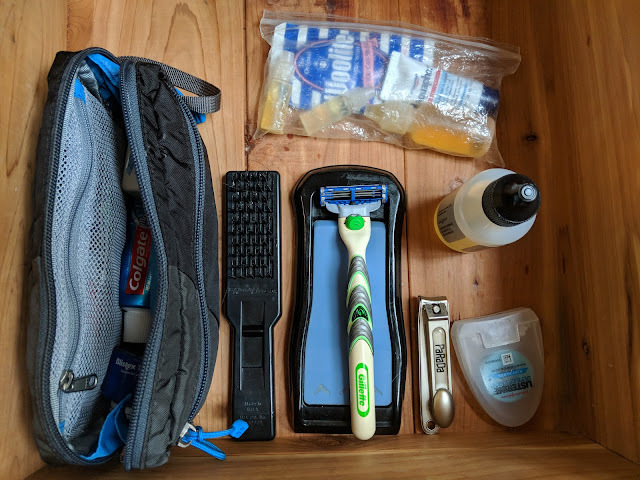 I am sure there are better razors and many people would suggest that shaving oil is a prep step which should be followed by shaving cream… but I have found this combination effective, reasonable cost effective, and compact when traveling. Listerine Floss (use to be Reach) is the most effective dental floss I have used. Gentle to the gums while still getting plague and food wedged between teeth out. PaRaDa Nail clipper with a trimmings catcher to make cleanup easy. Small first aid kit which includes waterproof Band-Aids, antiseptic wipes, anti biotic cream, superglue, a couple of safety pins. Small size HumanGear GoTubb to store aleve and a few nyquil caplets. Precision Xtra Ketone and Blood Glucose Meter* (not shown) for times I am fasting or engaged in a new diet and want some objective data. Cervelo R3: pricy but amazing road bicycle. Comfortable enough for an endurance ride, but responsive like a race bike. Fitted with an Infinity Seat, and a small seat bag which holds a pump, inter-tube, bike tool, and 2 tire levers. Moots makes some great Titanium bikes but you have to special order them. Power Tap P1 Pedals because I like objective measures about how my physically conditioning is changing. The Garmin Vector 2 pedals integrate better into the Garmin eco-system, use standard Keto cleats, and are lighter / more streamlined at about the same price point. Cygolight Expilion Bike Headlamp are bright enough to illuminate when I am riding fast and has a swappable rechargeable battery. Have a Cygolight HotShot rechargeable taillight. Giro Air Attack Shield Helmet provides protection, good ventilation while having a very streamlined aerodynamic profile. Has snap on optical shield which is great because with my eye prescription, it’s hard to find sports oriented sunglasses. If you ride a bicycle, wear a helmet!! I am alive today because I was wearing a helmet when I was in an accident. Giro has newer models which have better ventilation and aerodynamic profile and also cheaper models that will protect your head. Bicycling Shoes with Cleat for PowerTap peddles. Wahoo Fitness Kickr* is a great trainer for when you can’t get outside. Integrated power meter and variable resistance which can be controls via ANT+ or BlueTooth. Wahoo build the Kickr with an open API so there are numerous companies which have applications which can control the Kickr. I have a separate 3-season packing list which makes use of a number of the items on this list and has several items which are specific for backpacking. There are a few items I have kept as a specific way to honor people I have lost. Libby’s pins of a nativity scene and of a mother and child. Originally worn by Libby on special occasions they became daily decorations for the hats she wore during chemotherapy. They remind me of Libby’s courage and the two things most important to Libby, family and Jesus. Carl’s Rolex Oyster Watch to remember his craftsmanship, love of teaching, and ironically his frugality. Jules’ sculptures of musicians made from nails because he passed on a love for music and art. WWII Era Wool Blanket (not shown) Originally owned by Carl or maybe even my grandfather. It has been on countless fishing and camping trips and to virtually every picnic and outdoor concert I have ever attended. Everything I see the blanket I think of my dad and many wonderful moments. Google Pixel 2 on Google Fi has great integration with Google Apps, a best of class phone camera, and I find Google Assistant much more useful that Siri. In the locations I frequent in the USA, Google Fi has coverage that is competitive with Verizon and better than any of the lower cost carriers, while still being one of the cheapest plans. The plan really shines when traveling internationally, providing good coverage which is hassle free at very reasonable prices. I hoped the Pixel 2 on Fi would become my primary phone, but I found it’s management of audio (switching between built in speaker/mic, bluetooth ear buds, car bluetooth, and a USB DAC) to be buggy / inconvenient compared to the iPhone. In situations where the iPhone would automatically switch just as I would desire, Android would stay stuck on a particular audio output channel. I would have to go into the control panel and manually disconnect and maybe unpair/pair a device to get the phone to select the correct audio out I wanted to use. For me, this was a deal breaker. My son is now enjoying this phone. Timbuk2 Classic Messenger Bag (Small, Coated Nylon) is just the right size for my day to day needs with just the right amount of organizational pockets. I prefer courier style bags over backpacks because they are easier to access on the go and leave my back with more ventilation. This has been the bag that has carried my daily items to work 2001-2018. I appreciate that it is waterproof, and the fabric is heavy enough to retain it’s shape, but light enough not to be a burden. Pilot Precise V5 Extra Fine Pens are the nicest flowing pens I have ever used but often leak after air flights due to pressure changes. Arc’Teryx Atom LT Jacket is a lightly insulated jacket with side panels which are very breathable. A useful mid-layer insulation layer which looks good around town, and performs well in the back country. Was retired when I started to use my 23andme down sweater. Salewa Ramble GTX Shoes are attractive leather shoes which are breathable, waterproof and provide all day comfort. 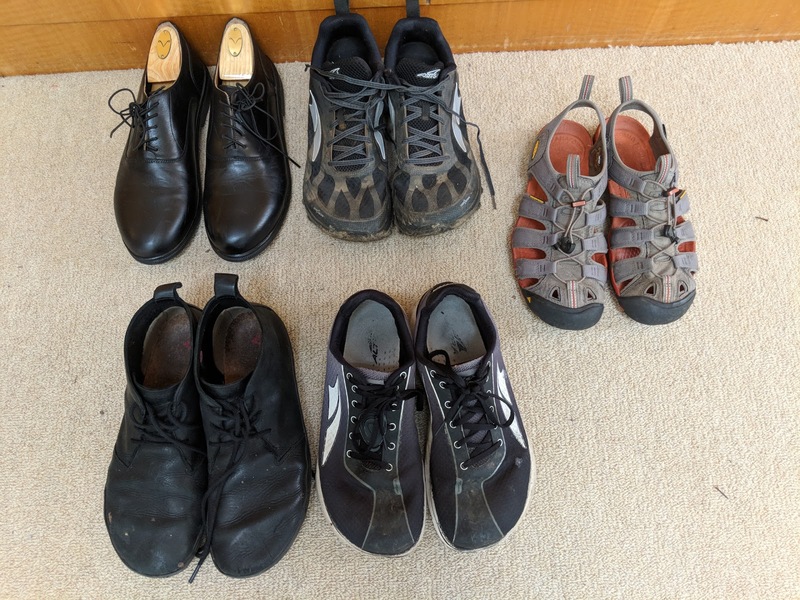 Generally I prefer more minimalist shoes, but wife really likes the way these shoes look, and apparently a lot of other people do too because I regularly get asked where to buy a pair. Replace by Gobi II which are more comfortable. Vibram Five fingers shoes for running about backpacking. Loved the lightness, ground feel, and lack of blisters, but I kept stubbed my toes when on trails. Retired when I found Alta shoes which give me the blister free experience I first had with the five fingers while providing more protections to my toes.